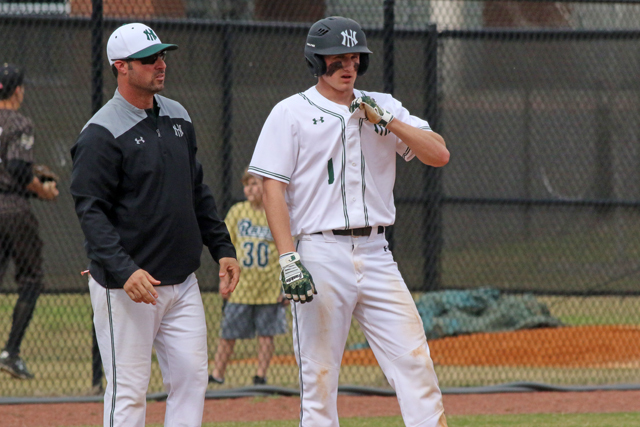 North Hall head baseball coach Trevor Flow is in his second season with the Trojans. Editor's Note: Trevor Flow is in his second season as the head coach at North Hall High School. He previously coached at Stephens County High School in Toccoa. His team competes in Region 7-3A. Q: You were a head coach at Stephens County where you had strong success, then an assistant at North Hall under Trent Mongero before becoming a head coach again. What is different, if anything, the second time around as a head coach? A: For me it was learning how to coach a baseball game. There is a huge difference in "knowing the game" and "coaching the game." The five years that I spent with Coach Mongero were like school to me. I knew everything we were doing and could read his mind most of the time, but I never stopped learning and asking questions. There was always constant communication between us and I consider him one of my best friends. Being consistent as a coach and learning how to properly conduct off-season workouts were huge learning curves for me between head coaching stints. When you have the opportunity to coach with a coach as knowledgeable as Trent is and learn daily, yearly, it is something that should be taken advantage of. We still lean on each other with questions and ideas weekly. There is no substitute for experience, so that played a great deal into my mind change between head coaching stints. Q: What was is like replacing Trent Mongero, who left for Glynn Academy, after the school won the state title in 2017? A: I am not sure if you replace a coach like Trent at any point. It was more of a mind set for me about how do I continue to create, promote and extend the culture that we have created at North Hall. I was with Trent for five years, two state championship appearances with one win and five consecutive sweet sixteen appearances with 20-plus wins each year, so I knew the formula for what had worked in the past, it was just a different role when you are the one that is in charge of continuing that formula. My greatest concern was becoming the leader of the program and not the pitching coach. It is a difficult transition sometimes when you have been in one role and one relationship with your players and then you are now the one who is overlooking it all. That's a change that I had to really think about before accepting the role. You dont replace a coach like Trent, you hope to continue what has been installed. I also knew that I needed quality assistant coaches in the program to do what I had done in the role I was in with Trent. I think we have an excellent coaching staff throughout the program and that is crucial to maintaining the right culture. Q: North Hall played a brutal nonregion schedule and didn't have the best record about midway through the season. How did you keep your team poised to do what they have done over the last few weeks? A: Well, when I originally started the schedule, I wanted it to be challenging because I knew that our region schedule would be difficult and we would need to be prepared for what we might see in the playoffs. I wanted our guys to get used to playing at a faster pace early. We had some returners, but not a lot of competitive experience in those guys. I did not know that we would get three big time teams at the beach, so that just added to what I had originally scheduled, which was fine, but at that point I realized that I needed a mental plan in case things didn't go our way, which they didn't. We actually played well in most of those games and had a chance to win which was a building point. We had new pitchers throw well and young kids get really meaningful innings early against great competition. I really paid attention to how consistently successful teams in the playoffs schedule in the preseason. We have always scheduled relatively hard, but for the most part, we have had experience returning on the mound, which we did not this year. We had to learn how to compete again. The rainouts cost us a few games that we probably had a chance to be more competitive in early on, but that's the way it goes sometimes. I constantly preached to our guys that we were not in panic mode and that we didn't make the playoffs based on our preseason record. I made sure that our coaching staff knew that we would focus on the positive aspects that could help us have the right mindset to compete in our region schedule. Adversity can break you if you dont approach it the right way, so that was a concern. I tried to stream-line our focus on the positives and the things we needed to work on for our region play, while holding them accountable along the way. "It's how you finish that gives you a chance," was preached a lot. Q: What are your best memories as a high school head baseball coach? A: My best memories as a coach are of course the state championship appearances and the 2017 win will always be up there simply because of the makeup of the team that we won it with. The individual players that come back every year that come into the dugout pregame or come to practice and seeing how it meant a lot to them is always a humbling experience. The phone calls and texts from the former players that keep up with our progress is awesome as well. And for me, seeing my son love to be at the games and realizing that at the end of the day, how we treat individuals is more important than wins and loses. I will always remember those guys that waited their turn and then took advantage of their opportunity as much as I will those players that were drafted or exceled. I love the fact that its still a Team game at this level and any day there can be a different hero. Don't get me wrong though, I thrive on the competition and seeing what a new group of guys can accomplish the next year and of course, I don't have a problem playing for more state championships.